Dell P4317Q 43 IPS LED LCD Wide Screen 3840x2160 Ultra 4K Multi-Client Monitor. In Easy To Open OEM Brown Box Packaging! Dell P4317Q 43 IPS LED LCD Wide Screen. 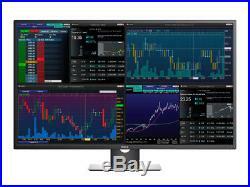 Resolution Ultra HD 4K Multi-Client Display Monitor. 4K large screen experience: The 43 display with high-performance monitor scalar offers exceptional clarity up to Ultra HD 4K. Multi-client capabilities: Connect up to four independent clients to a single monitor with customized views, all without bezel breaks, so you can take total command of your tasks. Simplify multi-monitor setups: Fewer cables, single mount setup and RS232 connection offer easy manageability. Included: 1 X Monitor Stand 1 X Display Cable 1 X HDMI Cable 1 X Display/Mini Display Cable 1 X Printer Cable 1 X Power Cord. Features : Keep an eye on up to four inputs from a central hub, with impressive color and clarity. Stunningly seamless: From Full HD to Ultra HD 4K, any array (from one to four) is beautiful and crisp1, without bezels breaking up your view. Clear collaboration: Colors stay consistent across wide-angle viewing up to 178°, for impressive visibility in group settings. Easy on the eyes: The true matte finish and low reflection mean you can work comfortably, even on long days. 107.98 cm (42.51 Inches). Preset Display Area(H X V). 941.18 mm x 529.42 mm 37.05 inches x 20.84 inches 1274.79 cm2 (197.59 inches2). 44% Haze with 2H hardness. 3840 x 2160 at 60 Hz (DP only). 178° vertical / 178° horizontal. 0.2451 x 0.2451 mm. Color Gamut (typical):82% (CIE 1976), 72% (CIE 1931) Color Depth: 1.06 Billon colors. Color Calibration with X-rite colorimeter. Dimensions with stand (H x W x D). Height: 658.0 mm (25.90 inches), (Not Height adjustable) Width: 973.1 mm (38.31 inches) Depth: 250.0 mm (9.84 inches). Dimensions without stand (H x W x D). Height: 566.4 mm (22.29 inches) Width: 973.1 mm (38.31 inches) Depth: 83.0 mm (3.27 inches). With packaging: 24.4 kg (53.78 lb) Panel onlyfor VESA mount: 14.11 kg (31.09 lb). 100 to 240 VAC / 50 or 60 Hz ± 3Hz / 2 A (typical). 70W (typical) / 160 W (maximum). Power Consumption Stand by / Sleep. Less than 0.3 W. 1 x DP 1.2 1 x mDP 1.2 2 x HDMI 1.4 (MHL) 1 x VGA 1 x USB 3.0 port - Upstream 4 x USB 3.0 port 1 x Audio Input 1 x Headphone output 1 x RS232. The advertisement of any product does not constitute an offer to sell. Your order does not signify our acceptance of your order, nor does it constitute confirmation of our offer to sell. We reserve the right to accept or decline your order. Ambiguity: In the event that something may seem ambiguous to you or you think we made a typo or a mistake. This agreement shall be construed under and in accordance with the laws of the state of Ohio, and all obligations of the Parties created in this Agreement are performable in Lake County, Ohio, United States of America. Powered by SixBit's eCommerce Solution. The item "DELL P4317Q 43 WIDESCREEN 3840X2160 IPS ULTRA HD 4K MULTICLIENT LED LCD MONITOR" is in sale since Tuesday, August 7, 2018. This item is in the category "Computers/Tablets & Networking\Monitors, Projectors & Accs\Monitors". The seller is "ascendtech" and is located in Cleveland, Ohio. This item can be shipped to United States, Canada, United Kingdom, Denmark, Romania, Slovakia, Bulgaria, Czech republic, Finland, Hungary, Latvia, Lithuania, Malta, Estonia, Australia, Greece, Portugal, Cyprus, Slovenia, Japan, Sweden, South Korea, Indonesia, Taiwan, Belgium, France, Hong Kong, Ireland, Netherlands, Poland, Spain, Italy, Germany, Austria, Israel, New Zealand, Singapore, Switzerland, Norway, Saudi arabia, Ukraine, United arab emirates, Qatar, Kuwait, Bahrain, Croatia, Costa rica.